In the previous pAsuram, maNavALa mAmunigaL requested sri rAmAnuja to give him a date when he would reach the latter. maNavALa mAmunigaL thinks that this might have triggered a thought in SrI rAmAnuja’s mind and he might have had a thought in his mind. The thought is that “hey! maNavALa mAmunigaL. Whenever your mortal body falls on this earth, you will reach me, as per the phrase “maraNamAnAl (thiruvAimozhi 9.10.5). You will eventually be liberated and reach the eternal abode of SrIman nArAyaNan, namely paramapadham”. maNavALa mAmunigaL puts a question back to SrI rAmAnuja as to what is the cause of this delay. Why should he wait till his mortal body falls at the time of death. Why can’t this be expedited right away? This is the crux of this pAsuram. podhindhu koNdu – that are etched in me strongly. nanmaiyil – good deed in me. nallArgaL – people with good character. maNavALa mAmunigaL describes himself in the first half of this pAsuram. He says that he is a very low person with nothing good about him as revealed by the phrases “nIsanEn niRai onRumilEn (thiruvAimozhi 3.3.4)” and “akruthasUkrutha:” He is a person who is full of qualities that are directly contradictory to the uplifting and liberation of a soul. In addition to that, he is a person who had literally no good character or anything that refines his soul for the better. He is a person who is always engaged in all those activities that are condemned by the ancestors and does them repeatedly. “prApyam archipadhAsathbis thath vishNOr paramampadham” is a phrase that describes paramapadham as a place that is desired by the elite people who are full of good deeds and character in them. maNavALa mAmunigaL says “Oh! emperumAnArE! You assured me that you shall grant paramapadham even to such a low person like me. You said those words realizing the relationship between us. However, I am unable to understand why is the delay in granting it? Are you thinking in your mind that I might have gone to someone else thinking they might protect me? 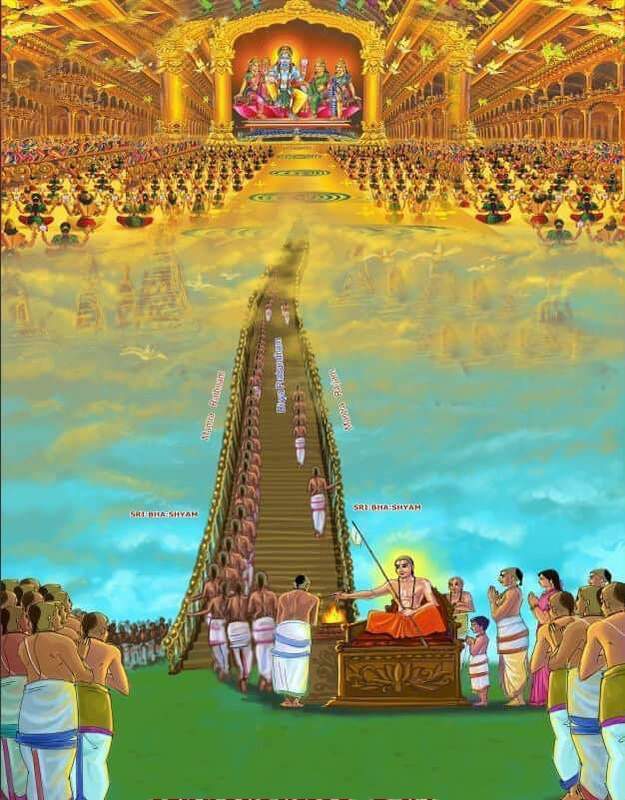 Are you thinking that, on my own effort, I can follow other routes laid by SrIman nArAyaNan to reach him in his eternal abode of paramapadham? Oh emperumAnArE! neither do I know anyone except you nor do I know any means apart from you. I do not have anything in me and I have no other place to go apart from your lotus feet. Hence, I request you to kindly grant me mOksham as soon as possible”. This entry was posted in Arththi prabandham, Other and tagged arththi prabandham, mamunigal, ramanuja on July 23, 2016 by santhanam rajagopalan.